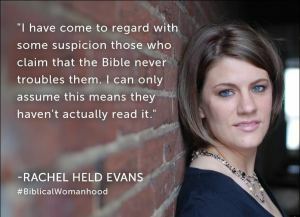 Rachel Held Evans has been called “the most polarizing woman in Evangelicalism.” She is a New York Times bestselling author of three books and a popular blog in which she wrestles honestly with the cruelties and contradictions in her Christian tradition from the standpoint of a loving insider on a quest to understand God and goodness more deeply. Her most recent book, Searching for Sunday, brings readers along as Held Evans, still a self-identified Evangelical explores and embraces the liturgical ritual of the Episcopal tradition. It is a loosely connected collection of musings structured around the seven traditional sacraments of the Christian tradition: baptism, confession, communion, holy orders, confirmation, anointing of the sick, and marriage. I’d like to subscribe to your blog by email, Howard, so I’m sure not to miss it. Not sure I clicked in the right place do do that, however. Thanks for the interest George (got your name by looking up your blog… and it looks fascinating and helpful, btw… added it to my follow list). I’ve looked and not sure if there is more than one way/place to follow my blog. But I think somewhere it should say, when you bring up the blog, “You are following this blog” or similar wording. I imagine you accomplished it. I used to be regular with at least one post per week, but lately sometimes it’s been a couple weeks or more between my posts. And thanks for following! Love to get your thoughts and reactions… as you may have noted, I don’t tend to get very many comments, which is both “good” and “bad”.